This easy mushroom soup is so creamy and comforting – makes a fantastic starter to any meal. Hey everyone, today’s post is a special one because I’m delighted to have Linda from Brunch with Joy on the blog guest posting today. I haven’t known Linda very long but we hit it off right away. She is super sweet and shares a great mix of creative and fun recipes on her blog. I mean check out her dream-worthy Ovomaltine Cake, these phenomenal Chicken Wrap Egg Waffles and this awesome looking Turkey & Chorizo Breakfast Hash. 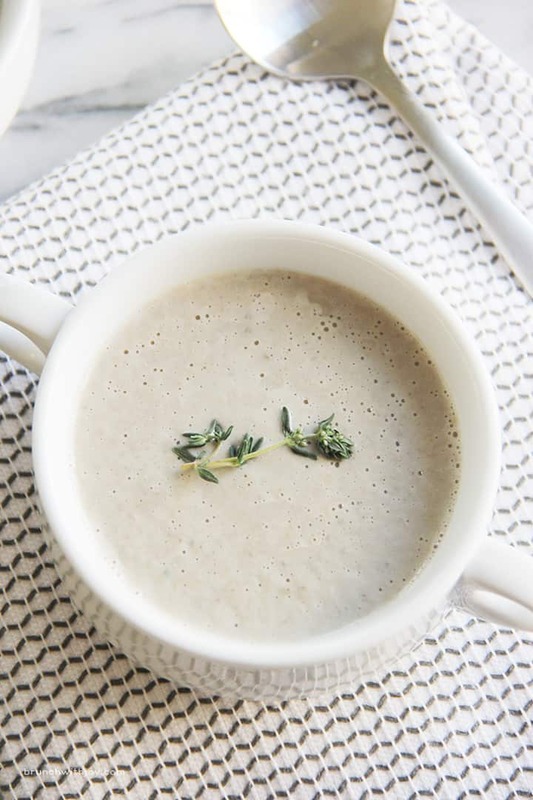 It’s also her 1 year blog anniversary and not only did she bring this wonderful Creamy Mushroom Soup recipe, she also has an exciting giveaway from Blendtec for all of you! I’ll let Linda fill you in on all the details. Take it away Linda! Hi, Life Made Sweeter readers! I’m so glad to be here today and thanks to Kelly for letting me share on her site. My name is Linda from Brunch with Joy. Growing up, my parents always encouraged me to try eating new foods even though they may look nasty and we could decide whether we liked it or not after the first bite. But still, although I am a foodie, there are some foods that I always avoided… and mushrooms was one of them. Every time I saw mushrooms on my plate, I would politely push them aside. I was not really sure what made me dislike mushroom. But that changed during my teenage years. One day, I hung out with a bunch of friends and went to a friend’s house. She served us… mushrooms! Big slice mushrooms. I couldn’t say no because the mushrooms were served over pasta and pasta was my weakness. And secondly, my friend cooked the dish especially for me, as she knew that I like pasta. I did not have the heart to tell her, so I forced myself to eat the mushroomed pasta. And that’s how it all got started. This creamy mushroom soup is a regular dish at our home, especially during Fall. It’s easy to make, creamy and comforting — absolutely a fantastic starter to any meal. Ironically, as I enjoyed the mushroomed pasta, she kept serving me the same dish, every time I went to her house… with extra mushrooms. This happened almost every week, or at least once a month. Today is also a fun day because BlendTec is here to celebrate my blogiversary and not only that… I also have some of my other favorite bloggers and dear friends to help me celebrate my anniversary with this giveaway. Check out the Crispy-Skinned Salmon with Creamy Cashew recipe at Hip Foodie Mom and the Strawberry Moscato Slush at Baking A Moment. And don’t forget to enter the giveaway below for a chance to win a Blendtec Designer 625 Blender. This easy mushroom soup is so creamy and comforting - makes a fantastic starter to any meal. Melt butter in a large soup pot over medium-high heat; cook mushrooms in butter until soft; reduce heat to low. Mix onion and garlic into mushrooms and cook until onion is soft and translucent. Stir flour into mushroom mixture and cook, stirring often. Add thyme, milk, and chicken broth into mushroom mixture. Bring to a simmer and cook for 30 minutes in low heat. Season with salt and black pepper. Transfer soup to a blender and puree on high speed until smooth and thick. Linda, thanks so much for guest posting here today and for sharing this fantastic recipe! Happy Blog Anniversary! Kelly, I love blender soups!!! Linda knocked it out of the park today with all of the fabulous recipes!!! I’m so happy to be celebrating with her today and you and Allie!!! Linda, this soup is gorgeous!!!! Thanks for sharing, Linda! This soup looks absolutely fantastic! Cream of mushroom is one of my favorites, so I’m loving this. Looks so full of flavor and perfect for lunch or dinner! The cups this soup was photographed in are adorable! And the soup looks delicious too! How sweet, Kelly! I love blog birthdays!! (my blog just had one too) (: She did an amazing job with this soup. It looks so delicious. So nice of you to celebrate the occasion with Brunch with Joy!! the soup is gorgeous Linda! I love mushrooms! So happy to be celebrating with you! Thanks for sharing this gorgeous soup with us. Happy blog birthday! 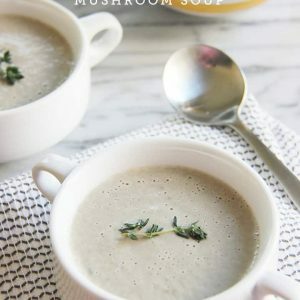 I am not a huge mushroom fan, but I think you may have made me a believer to try out this soup. It looks amazing. And I just love this giveaway. I may have to enter. I hope to see you at my new blog next week. Cream of mushroom has always been one of my favorites! This looks divine! 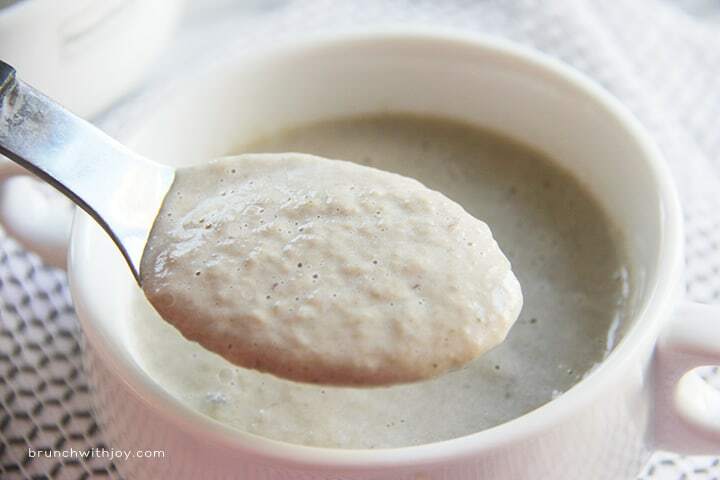 Love mushroom soup and glad this one is made in a blender! Happy Anniversary Linda! Great giveaway! I just met Linda over on Alice from Hip Foodie Mom’s blog! Glad to see she made it over here too. 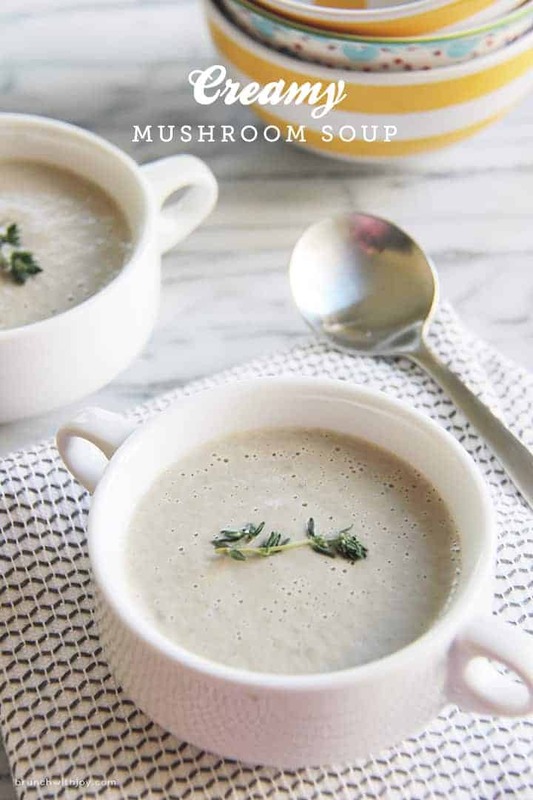 This mushroom soup looks amazing and what an awesome giveaway. This soup looks amazing!!! Love how creamy it is. Great recipe Linda! And happy blog anniversary! This soup looks delightful! Super creamy and I bet it’s so flavorful, too. I love mushrooms! So happy to be celebrating Brunch with Joy’s blog birthday with you, Kelly! And Linda- this soup looks phenomenal! I love mushroom soup, especially when it’s so smooth and creamy. This is absolutely gorgeous! Fabulous recipe. This makes me think of cream of mushroom soup without all the chemicals. Love that it can be used in other recipes as well. Thank you so much for introducing another awesome food blogger! I used to despise mushrooms when I was young, but they are wonderful to work with now. I love the rustic and earthy smell of these mushrooms! This looks wonderful!! Super creamy and rich! Can’t wait to try! This is so pretty and awesome giveaway! Wow, this soup sounds so good! I love mushrooms and this looks 500 times better than the stuff in the can. So great! Thanks Maggie! I totally agree, Linda did a great job on the soup 🙂 I am a big fan of mushrooms too!